We’re proud to serve our Victorville residents with the most quality storage units you can find in the area. Not only are our prices affordable, but you can feel confident knowing that your belongings are safe and secure. Your in great hands when you store with us! It’s easy to understand why Victorville has commonly been used as a place for commercial filming. With beautiful places like Spring Valley Lake, US Route 66, the Veteran’s Memorial, and the Old Sheriff’s Office, we believe Victorville is a great place to live. If you agree and call this city just outside of LA home, you’ll be glad to know that we have two locations in the area. Do you live nearby in Adelanto, Apple Valley, or Hesperia? We’re just a short drive away from you! Each of our facilities is equipped with convenient access, superior amenities, and affordable rates. Choose your preferred location today. One feature that customers love about Bear Valley Self Storage is our “no obligation” approach to renting. All of our leases are month-to-month, meaning that you can stay with us as long or as short as you like. We are here in Victorville to make your life easier, and we love to save you money along the way. Bear Valley Self Storage is home to a number of different deals, including military discounts, long-term discounts, senior discounts and student discounts! We’ll even provide the free use of a move-in truck when you rent a 10'x10' space or larger, subject to availability, once you make your rental. You can access your unit from 6 a.m. to 8 p.m. every day and get help from our professional staff seven days a week. If you live in Victorville, California or the surrounding High Desert area, your storage hunt ends here! 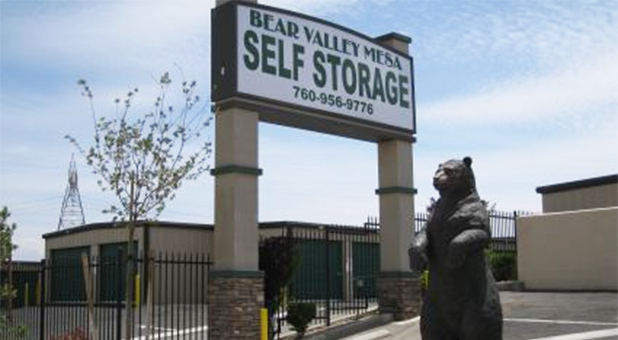 Bear Valley Self Storage is a self storage facility packed with the best amenities and prices around. Just like you, we value security and convenience. That’s why our facilities are equipped with 24-hour video security cameras as well as electronic gates with coded access. When you need to access your unit, you can pop right in and get what you need without any hassle! Our shop is filled with boxes and storing supplies so that you always have access to anything you may need. Check out our locations and visit us today!